Still drinking at The Mad House, and I saw a corked open bottle of Pepe Nero in my friend’s fridge. I asked him if I could have the rest, and he happily agreed as he said he did not like this beer at all. “Mikey will eat it,” I said. The rest of the bottle was enough for a pint glass full, which as again the Oskar Blues logo glass as the last beer. Pepe Nero poured a nice deep black color with a finger wide tan head with good retention and lacing. Very nice looking beer. I pick up the pepper right away in the aroma. I must have a nose for spicy, cause I am always picking up peppers first on certain foods/drinks and sometimes my fiends can’t find it at all. Anyway, there are also smells of the malts which give off a bread-like aroma, and some caramel. After a while, the lingering aroma in my nose is similar to liquorish mixed with dark fruits like plums or prunes. Very impressive. Taste wise, it is also a complex blend of plums or prunes, liquorish up front, followed by a back end of bread-like, caramel malts and yeast flavors. The peppers are also present throughout, leaving a light spicy burn on the nose and throat after the drink. The mouthfeel is smooth, almost cream like, and the body is a nice medium thickness. Overall, I was very impressed by this beer. Here we are though, in one of those situations. Should I stand up against the man, or be honest with myself? Ever since the press release that the beer giant, Anheuser-Busch bought them out, it has left a sour (not in a good way) taste in a lot of craft beer fans, and industry people alike. Possibly soon enough, the take over will result in a more watered down version of the beers already produced by Goose Island, and for all I know, they already are since these are the first beers I have ever tried from this brewery. 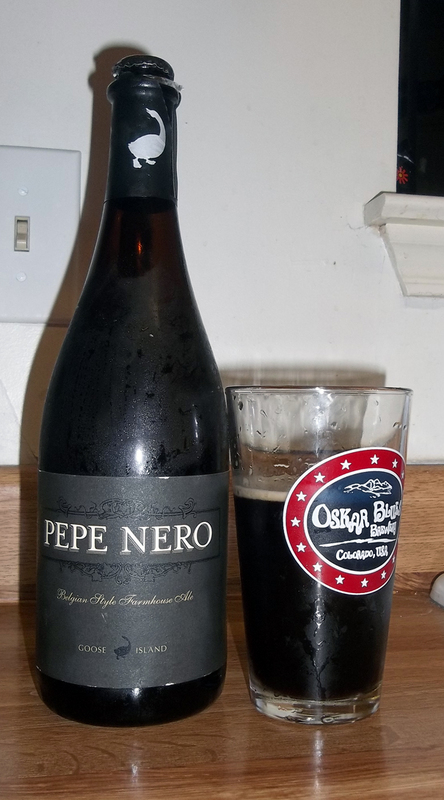 For Pepe Nero, I will say that this beer was excellent, and I would drink it again. It is always a good time drinking at The Mad House for me, and this song always pops up in my head before I head over there. This is one of my all time favorite bands. I give you, ANTHRAX, and their song, “Mad House” from their 1985 studio album, Spreading the Disease.